Zadie Smith! In a church! Talking about NW! She wrote On Beauty because she wanted to populate the kind of gentle, uplifting novel she grew up reading (like the works of E.M. Forster) with people of colour like herself. What would a story like Howards End be like if the protagonists were more like her? With each novel she writes she needs to find something that feels fresh to her, that will keep her interested, and this was what did it with On Beauty. Smith said that Leah Hanwell, one of the point of view characters in NW, came in part from her desire to write a character who is adrift and who’s not particularly strong-willed, because that’s how she herself feels a lot of the time. 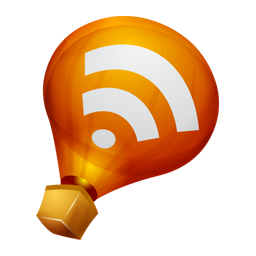 Circumstances often make people passive, but that’s not something that’s very widely represented. Fiction obscures it out of necessity, because the drive of narrative privileges the experience of those who are more adept at making things happen. Also, when she wrote NW she wanted to acknowledge that not leaving the neighbourhood where you grew up is not necessarily a sign of failure. The sense of local history you get when a particular community has been in the same place for a long period of time is valuable. There are layers of history to such communities, and the longer you’ve been in a place the stronger these roots become. Smith’s characters are often the kind of people who feel divorced from British history, but the history of their own communities is British history too. She wanted to show that these histories were of worth by not having leaving these neighbourhoods behind be everyone’s life ambition. On a similar note, she wanted to write a novel where the characters didn’t necessarily progress towards “improvement”. The assumption you should want to escape your class, instead of making things better for everyone in the same circumstances as you, is in itself deeply classist. Smith said there are certain ways of life with class associations, like strong community ties, that really appeal to her. She dislikes the idea that the better off you are, the more private your life ought to become — private schools, private cars, private jets, secluded holidays. None of that is particularly compelling to her as a way of life. She also said she’s been asked several times why she opted for such a “specific” focus on NW instead of writing a big, sweeping London novel, and this strikes her a question that’s loaded with class assumptions. A more privileged point of view than that of her working class characters is just as specific, only people are used to thinking of it as the default. Even in the work of someone like Dickens, whose novels are considered sweeping and all-inclusive, the people of the street often read like tokens or moral examples because the overall perspective is still privileged. The only way she found to truly include the kind of people she wanted to write about was to give them the reigns, to make them central, to allow them to speak for themselves. If their voices had been contrasted with voices of characters from middle-class backgrounds they’d inevitably get sidelined, because we’re so used to affording the latter more authority and importance. She sees the last scene of NW as a kind of Roschard test of political convictions (and I remember thinking the same back when I read it): you interpret it very differently depending on where you stand on the political spectrum. There are people who actually see Natalie’s “we deserve this” as a reasonable thing to say — but as much as the idea horrifies her, she wanted the novel to have that kind of openness. She wanted those questions to linger despite her own rejection of the myth of the meritocracy, because there are the sort of questions we grapple with in life. Lastly, a some comments on writing: Smith said she’s of the opinion that craft is what releases writers to be sincere. There’s no art without technique: even writing that seems “natural”, deeply heartfelt, and like it sprang to life fully-formed is the result of intense labour and deliberation. This is what writing is. I must say, I'm rather envious of all the book signings you get to go to, for the same reason you enjoy them--hearing great authors talk about their books and their writing would be so nice. Along with my (benign) envy, though, is excitement for you. Zadie Smith! I'm SO jealous! How wonderful. I got to see Smith reading, but didn't get to go to the book signing part, which was disappointing. But since I'm sort of close to NYC and she lives here some of the time, maybe the chance will come again. Beautiful post, Ana! And nice picture! 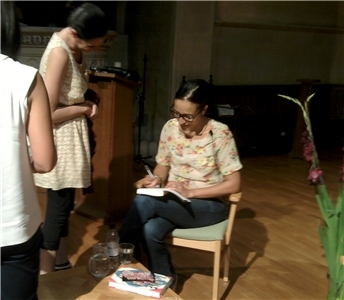 Wonderful to know that you had a great time at Zadie Smith's talk. So jealous of you :) Thanks for taking notes and sharing your thoughts on the event - it made the event come alive for us. I loved this sentence from your review - "the drive of narrative privileges the experience of those who are more adept at making things happen" - it is crafted in that beautiful way that Zadie Smith describes. 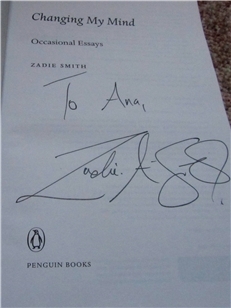 I love Zadie Smith's signature - it looks so grand and majestic. Thanks for this wonderful post. How exciting! I am adding NW to my wishlist. I like living vicariously through your book-signing adventures. Also I like the Freudian slip of "give them the reigns" when talking about the less privileged. Vishy: I'm glad you enjoyed the post! I thought that was such an interesting point, and it resonates with something I keep thinking about - how we as a culture love stories about individual acts of heroism, when in reality excellent people are often swayed by circumstances they can't control. Marineko: Aw, I wish they would too! I feel very lucky to be able to do these things. Stephanie: Do! It's a really interesting and thoughtful book. I'm completely with you about bookish events, the signed copies are wonderful, but it is really the experience of hearing the author talk that is so incredible. I just mentioned Zadie in my post today! I would love to meet her.